Fireman Rolf with Chief Officer Mathews (bottom left) and the team that dominated the 1934 IWFBF drill competition (which one is Rolf is not known). Fireman Bernard George Rolf passed away shortly after contracting pneumonia on 20 January 1937 aged 36. Bernard was born in Godshill in autumn 1900. The Census taken a few months later details that the Rolf family resided at Rookley Cottage. His father George worked as a contractors carter and his mother Hilda, only 18 at the time, was the daughter of the head of the household Jeremiah Squibb. The Census of 1911 shows that George and Hilda now had their own home at Lower Yard Farm, Godshill, where George was a farmer. A 5 year old daughter Violet has joined the family in addition to Frederick Attrill (19), listed as a farm servant. Around this period the Godshill Parish Council had made arrangements for fire protection with Shanklin Fire Brigade (and later with Ventnor for other parts of the district) and the brigade, then under Chief Officer Rayner, made several visits to Godshill where they carried out drill displays to reassure the parishioners that the part of their rates that were forwarded to the brigade were a wise investment. It may have been seeing these displays that inspired the young Bernard to partake in the role of the fireman in adulthood. On Boxing Day 1923 Bernard married Sarah Ellen (Nellie) Griffin in Godshill. On 7 July 1929 they welcomed their only child Anthony Bernard into the world. This date places it in the middle of a fascinating week of firefighting when Shanklin hosted the National Tournament of the National Fire Brigades Association attended by 59 brigades from across the country. The accompanying programme of twenty-nine pages lists Bernard Rolf as a competitor but the competition drills didn't begin until the day after his son's birth. At what age he moved to Shanklin and exactly when he joined the brigade remains unproven. His name first appeared in the Press in association with Shanklin Fire Brigade when he formed a part of the brigade's team that competed in a National Fire Brigades Association district competition at Romsey on 16 May 1932. The team of which Bernard was part were runners-up in the district motor-pump competition. Often the Shanklin team travelled with those from Sandown, who for the early period proved the dominant brigade. Under Chief Officer Matthews the Shanklin brigade began to gain ground and emerged as the superior Island based team, a matter emphasised at the IWFBF competition in the grounds of the Frank James Hospital on 31 August 1934 when Shanklin won all four of the principle trophy's on offer; Bernard was again a member of the team. 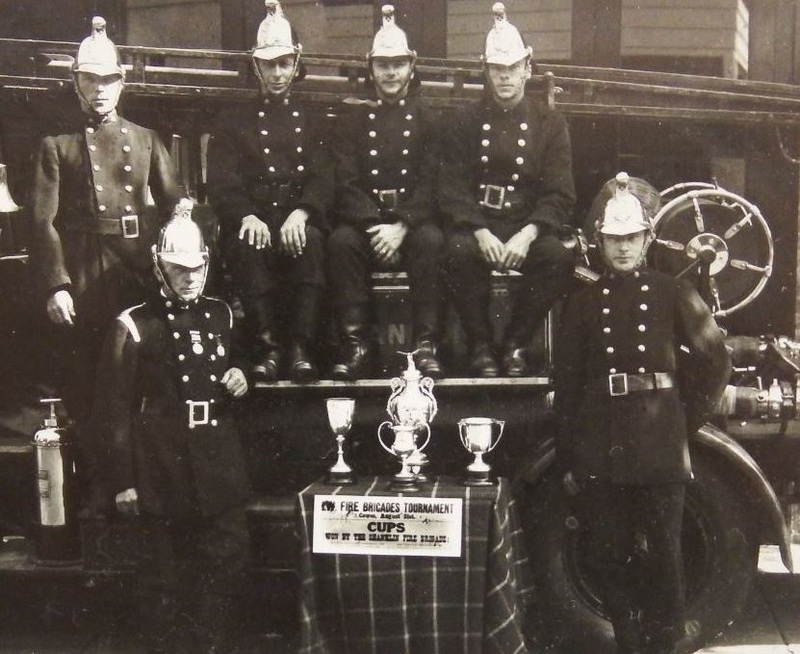 Of those awards, the most eye-catching was the Couldrey Challenge Cup which remains in the Shanklin Fire Station trophy cabinet to this day as they won it (for the fourth time) on the last occasion for which it was competed in 1939. Bernard's death came as a terrible shock to Sarah, their young son, the family and the fire brigade. In reporting his death the County Press remarked; He was the driver of the District Council's refuse trolley. He was of a jovial disposition with a wide circle of friends. Rest in peace Fireman Rolf.